Help I'm worried about the whole social media thing! I've been making bears since Nov last year so am very green and have tons to learn. But I am very committed to learning my craft and putting in the hard work to be successful. Well we all have to start somewhere and I have no need to explain to you all the excitement and pleasure of creating bears, the hard work bit for me is the business/marketing side. So here's the thing. I'm struggling with an issue that I hoping for some advice on - Facebook and twitter. Is it possible to be a sucessful bear artist without this presence? I'm holding off singing up for now. My main problem is that I am afraid of getting on the 'I like you so you have to like me' it all seems awfully ingenuious. Facebook as everybody keeps telling me is a tool that should be used to it's full advantage. But facebook IS people isn't it? - wouldn't that follow that I am using people for my own advantage. That's the bit I feel uncomfortuble with. I freely admit that I don't understand/ have tried it and of course may have got this all wrong. How do you tell the difference between friends that are only out to use you and the ones that are actually interested? How do you avoid some friends without hurting any bodies feelings? Is it a case of normal morals don't apply on these sites? I would hate to upset anyone by my lack of social media savvy. What do you fellow bear makers get out of facebook, is it just an end game of promotion or are there other reasons that I don't know about? Will I have to blog? I lead a pretty uneventful life not sure what I'd find to talk about! I tried to load an avatar but all my images seem to be too large so I will put a picture in here. This is Worried Ralph a bear who worries about everything. Wonder if he worries about facebook! I love Ralph, Michelle! I am a bit of a worrywart myself, so I can totally relate to Ralph's state of mind. I see you have a page on Etsy and Bearpile, so your goal is to sell your bears. In that case I do think it's a good idea to join FB. You don't have to dive in head first, but you can dip your toe in it and see how you like it. Set up a private FB page and make a few friends (like Carrie and I and many other TT'ers) and then you can start to explore; find out what you like and what you don't like; what you want to share with your friends and what you want to keep private. 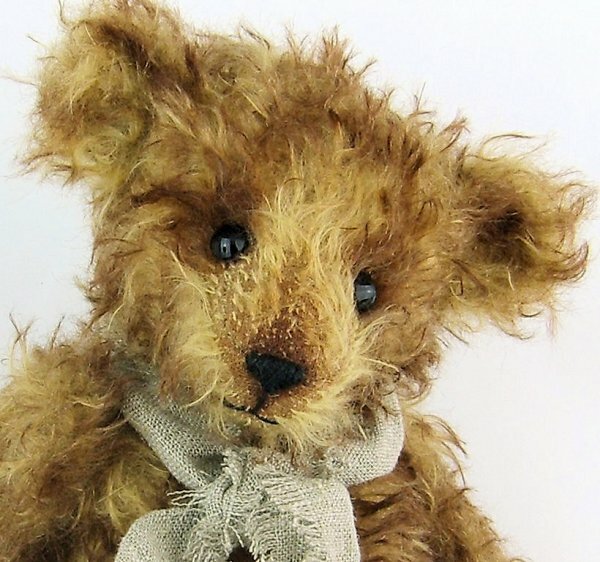 Later on you can decide to set up a special page for your Padfield Bears. Is it self promotion? I guess so, but at the same time you are showing people your skills as a bearmaker: some will like your work, others not. Those who like your work, will appreciate it when you show them your new creations. And don't worry too much about social conventions: a bit of common sense goes a long way; and just as in real life; you will find out who are genuine friends and who are fair-weather friends. Thankyou for your kind words Carrie and Peter! You are both right I know the only way I will get to grips with it is by having a go. I am putting it on my 'to do' list for July. I sometimes think I must be the only person left in the world who isn't on FB! Nothing ventued nothing gained will be my new mantra Deep breath and dive in! Yes Peter I am trying to sell my bears as I need to be self funding plus my house is so tiny that I am running out of space! I love being surrounded by furry friends but my other half is getting a bit taken over Your avatar bears are lovely big boys I am a sucker for a big bear that you can have a proper cuddle with! 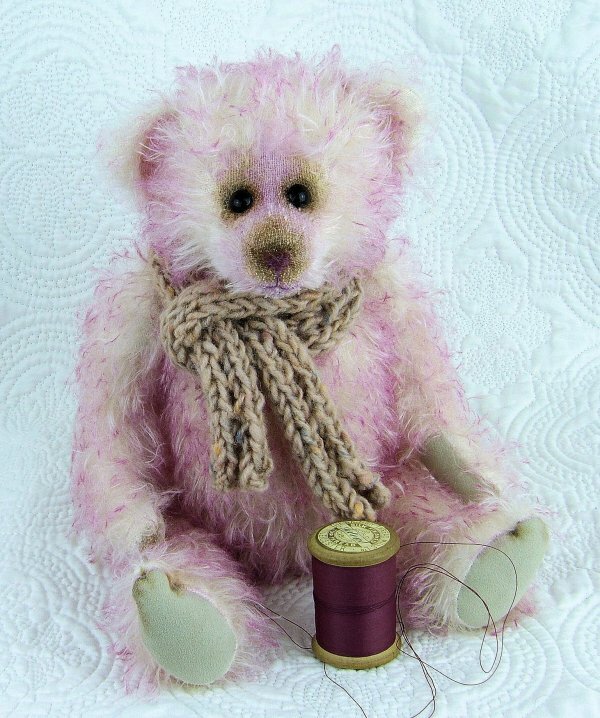 Carrie I had a look at your bears and they are sooo sweet you are fab at girl bears for some reason mine always seem to be boys. How does that work? Even when I start off with a girl in my head somehow she morphs in to a he. I love the way you applied the cute rosy cheeks. This is Peter Sausage who is a case in point. Despite my good intentions by starting off in pink and a smaller muzzle Peter was definately a boy. He sat for a week with a lovely pink flower over one ear but just kept looking at me with 'hey c'mon what are you doing to me, do I look like a girl! ' and in the end I gave in and knitted him a scarf! This was one of my earlier bears and I found the pile of this mohair difficult when trimmimg as it was so deep. Like I said lots to learn. So once again thank you for taking time to reply and I will 'friend' you or what ever it it I have to do when I join FB if I may. All I need to do now is join a gym and I will have conkered all my fears of weird other worlds that I don't get.... Yeah like that's gonna happen!! Other people only have a personal page, and that can be done well (for example, you only post about your teddy bears, you make the posts public, and you allow people to find you and subscribe to your posts) or not (for example, you try to amass thousands of "friends" only to market your bears to them). The latter are the kind of friend requests that I don't usually accept. It sounds like a lot to sort out, and in some ways it is, but you can do it over time. It is an excellent (and free!) way to connect with potential customers. Edmondnutmeg, your bears are beautiful, and yes it is important to use social media. It will help collectors find your work. I keep just a personal page on FB, I do not do Twitter. I have it set up like Becky described above. I keep it open for subscriptions, that way anyone can follow without them having to friend me. I keep all the bear related stuff public so anyone can see it. I do get lots of friend requests. I pretty much say yes to everyone. I decide what I want to see from all my friends in the settings feed. I like looking at pictures, so if I don't know someone I will see only their pictures and block everything else. If I don't like their pictures I block them too, but still remain their friend. No one knows how you have your settings but you. I do this with everyone as soon as I accept their friend request. I use FB mostly just for my creative stuff. But once in a while I will post something private. I have everyone of my friends on a speical list. The lists are anything you want them to be, you create them. I can post only to a special list. FB is important I think. The collectors are there, so are the bear makers, and many of them are also collectors. There is so much creativity there, and it is very inspiring. Since I have my page is mostly set up to only show pictures, it is just a feast for my eyes every time I visit. Boy you bear people are so helpful! Err while I'm talking about groupies - Joanne I got a rare chance to see a little bear of yours at TGYTBE that belongs to Katherine Hallam. It was truly stunning in skill and design it is very inspiring and not just to me I can tell you there were several of us crowding round cooing! Becky that explains a lot I think I may have been mixing up likes and friends and I can't tell you what a relief it is to know that there is a level of control and nobody knows if thery are blocked or not. I would be gutted if I spent ages setting Fb up only to be rejected left right and centre and ended up as a Billy no mates I clicked on your face book page and with the info made a lot more sense. Eddie is great! I am working on a panda myself at the moment, I also Gregor. Kelly I couldn't find your fb page without a link on here but thanks for the encouragement you can't beat doing your patterns! My plan is to sit down together with my cousin and get her to show me around her private page and her business page so I can see how it works sign up and then do some reserch looking at other pages before I take the plunge. I can understand very well why you were/are a bit hesitant about facebook and such. I dont have it myself either and doubt I ever will. Now please dont get me wrong, i'm not saying one should stay away from facebook and i certainly think it can be a great way to get your work out there and get to know more teddy people In my case it's a matter of personal choice and very bad experiences with social media in the past. Personally I prefer and am very happy with sites like this one. I think it's an awesome place here with a good moderation system in place. I think Peter, Becky and some others gave you some real good advices and if I was you i would go along Peter's way, dip your toe in it and slowly extend to learn to filter out what you like and don't like. Make sure you indeed have one or a few trusted Teddy people to get you into it and familiarised with it all a bit. That worried Ralph bear looks amazing !!! I'm pretty much a worrywart myself ! That bear would fit me ! I dont have facebook. But I love my blog and the contact between the people there. Perhaps there is a way for you too. Having a blog is easy and free. I clicked on your face book page and with the info made a lot more sense. Eddie is great! I am working on a panda myself at the moment, I also bear_wub Gregor. Thank you, Michelle! I'm happy that you like them, and I'm looking forward to seeing your panda! Facebook can your best friend...and your worst enemy. I have had troubles with it..mainly because I am a person who has opinions on lots of things....not just beary...and do tend go write about it. I found that when I friended all who asked I think they supposed I would just be a fluffy beary soul who chatted about bears all day..and that is not me. So I opened a Three O'clock Bears page that people who don't want to read my random ramblings and rants can follow. It's an easy thing to maintain now...and I update it every day...with anything and everything can think of. Work in progress, the dog just to stay in the news feeds. Now I have upwards of 2000 linkers and have sold bears to lost of new customers. That's down to the effort of maintaining that page. And it's not hard to do. I don't say yes to every 'friend' Who asks me on my personal page .. I check out who the are first...I check if we have mutual friends...do. Know them..if not I decline. I don't want snoopers and freaks following me. I have had some very odd people latch on to me over the years...and I worry about that aspect. I understand why you don't want it I. Your life but in all honesty it is the way people communicate now and if you want to join this online selling thing it's best to engage in whatever the buyers do to get seen.